A little while ago I had the pleasure of dragging my husband to the Ballet... Two weekends in a row:) Lucky me.. One of the shows we went to was Swan Lake. I absolutely loved it! The one thing that I noticed was that all of the swans were in the same costume. I was of course searching for Odette (The Queen Of The Swans) and noticed that she only stood out by wearing a little silver crown. Now, I am not going to start wearing crowns.. But I did get an idea to make a necklace with silver and the bright white colors of the swans. 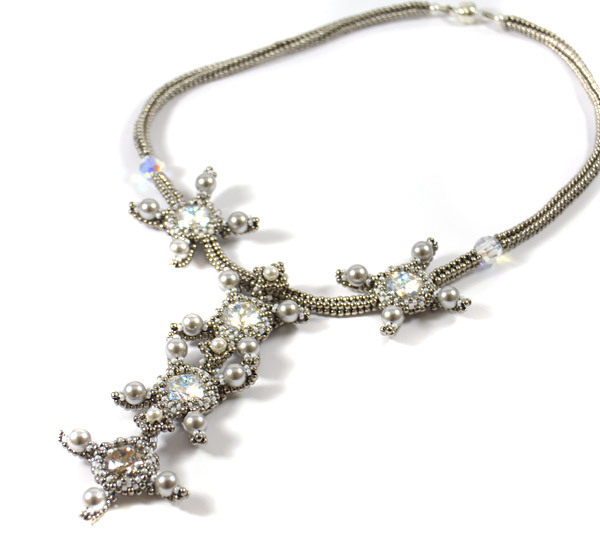 The 6mm Swarovski pearl points on the necklace are made with a beaded base to keep them in place and the Swarovski stones are the beautiful new white patina color. The pendant section of the necklace measures just under 4 inches.